This is the first book in the Fantasy series with a hint of Naturalism. Ever, though human, has special abilities herself as she can see people's auras. She used to be The Most Popular girl in her school until her parents and sister died in an accident, forcing her to live with her Aunt in a new place and a new school. Her ability caused her to be an introvert until she met Damen Aguste, for some reason she can't see his aura. This made her curious and drew her to him until the next thing she knows she's falling in love with him and getting caught up in his Immortal world. The question is, can she deal with it? ﻿In the tradition of the Emo Movement, this is another series that will surely appeal to Gen-YA who follows the likes of the Twilight Saga, Fallen Series, Vampire Diaries et al. 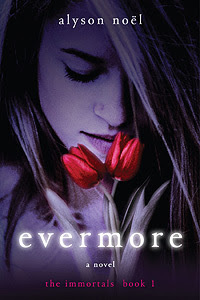 Dark, mysterious and has all the Drama one hopes for... if you're a teen anyway. I've read this book a couple of months back and my reaction to it is lukewarm although I find Damen Aguste very seductive. I know I'm a little "aged" to be reading this but the thought of reading about Immortals has a certain appeal to me. The fact that they've lived through lifetimes and witnessed countless historical events and man's progress or regress is fascinating. They're like a walking Wiki of sorts. I know the reviews about the series out there is mixed. But to be fair to Alyson Noel, if I were in the middle of my hormone peaks and embroiled in High School drama, I'd surely appreciate the escape this series provides. It's not so bad because (1) it's a good switch from all those Vampires and Fallen Angels; (2) Ever is a smart girl who though allows herself to get swept away by the moment, still has the brains to question things; and (3) she FIGHTS and is not helpless like some teen heroines I've read. However this still doesn't top my list but I'm about to read Blue Moon and like most series, I'm hoping book 1 is just a warm-up and as the series continues I'm hoping that in turn I'll warm up to it too. Hey, if I can read and finish Twilight and Fallen, how bad can this be?